﻿We believe in the Emergent Curriculum philosophy, which emphasizes the cap﻿abilities and creativity of the child and teacher. This approach builds upon the interests of the c﻿hildren and focuses on the process of learning. ﻿We do not divide learning into discrete blocks of time for math, language, etc. Children learn about themselves and the world around them through investigation and discovery, and through art, dramatic play, and social interactions. Therefore, important areas such as literacy and numeracy development are introduced and woven through all activities. Research shows that children learn best through play, using their bodies in active learning. We provide many learning opportunities through meaningful play. To learn more about the Emergent Curriculum approach to education, please visit our Resource page. Learning Centers: Centers are available for child-initiated, teacher-supported learning. Teachers set up several centers each morning. Children can play and work at any center for as long as they like or move from area to area. 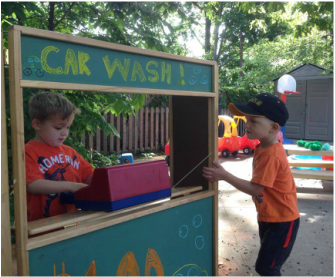 Centers may include art, play dough, science experiments, blocks, games, dramatic play, writing materials, or the sensory table filled with water, sand, or other tactile materials. In the Pre-K classes, there is also small group time to focus on children’s individual goals. Snack time: A healthy snack is provided by a parent each day. Circle Time: Teacher-directed story time, music, sharing time, group discussion, and whole group learning activities. Outside Play: Because children benefit from exercise and fresh air, we take the to the playground as much as possible except in bad weather (20 degrees or below with the wind chill in the winter). We have a playhouse for dramatic play, jungle gym for climbing, and balls, tricycles, and shovels available for outside play. The school week also includes a visit to the library, yoga (for our 3-5 day-a-week classes) and drumming. The day can be extended with our Extended Day program. Please see the Enrichment section for more information.